IT WAS 10 years ago that Mercia Marina was transformed from a little-used fishing lake to a major tourist and leisure destination. So a host of spectacular celebrations are being planned to mark the Trent & Mersey Canal marina's 10 years anniversary. It started life in 2008 and following investment of more than £8.5m, sets new standards for inland marinas in terms of design, landscaping, wide open water space, infrastructure quality and service provision. The picture shows the building of the actual marina with a few jetties in place. It is now one of the largest inland marinas in Europe and attracts over 800,000 visitors every year as well as being the home to moorings for more than 600 boats and the location of 27 privately owned holiday lodges. 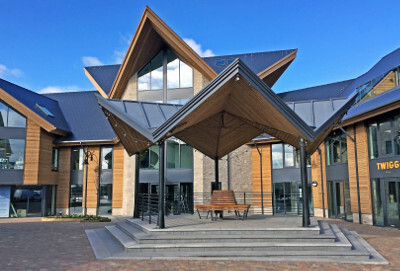 First-class businesses are also based in the marina in the £1.7m national award-winning Boardwalk (pictured) development, which opened in 2014, and the new £3m Piazza landmark building, (pictured below) which opened late last year, giving a total of more than 20 businesses, including boutique retailers, eateries and pharma, IT and financial businesses occupying the office space. On Saturday, September 15th, there will be a series of private events for moorers and lodge owners including a hog roast, BBQ, picnics and entertainment as well as big band music, line dancing and music which will continue into the evening. The following day there will be free events open to the public from 12 noon, including live music kicked off by solo artist John Rockliffe, followed by a musical line-up including Pocket Playhouse, Beatle Mania and the Rat Pack Trio, along with other artists playing throughout the day. Stilt walkers will strut the boards of the Boardwalk and Piazza throughout the day and there will be street performances from bubble artists and entertainers. There will also be face painting and some street magic along with an array of food and drink stalls. Later in the evening on the Sunday, there will be a VIP drinks reception for key people who have helped, supported, contributed and driven the marina forward over the years, and this will be followed by the unveiling of a new sculpture and a stunning fireworks display. “From grassy fields first acquired in the 1980s, Mercia Marina has become a major regional tourist attraction which continues to flourish. “We always strive for the highest standards, acquiring awards in conservation from David Bellamy, a five-star grading from Visit England and national awards for our Boardwalk building. Add to that the recently opened £3m Piazza building and our new 200-space overflow car park and we are confident of a bright future. A new overflow car park will be ready in time for the anniversary weekend and this will provide parking for a further 200 vehicles.